A few years back, I bought a brand new GReddy Ti-C cat back exhaust for my Mitsubishi Lancer. The day it arrived, I was under the car, removing the sway bar, removing rusty bolts, getting rid of the raspy factory exhaust. And then, when I got it all lined up and bolted back together, I went to reinstall the Progress sway bar, and it wouldn’t fit! This was the first time I ever modified a car to such a level (it was a base model and didn’t have a sway bar from the factory) that parts were discovered to be non-compatible with one another. I drove it without the bar for six months or so, loving the exhaust note and the new lack of hesitation in the upper rev range, but hating the loss of cornering ability. This was when I first heard on Evom about S&R Performance, a shop in Tampa, FL. Full disclosure: As with all previous articles thus far, I was not hired or paid to write this, I just happened to hear at the last minute of an Evo meet at S&R on the same day in June that I was attending the cars & coffee event at duPont REGISTRY. I’ve always liked the shop due to the extreme variety of cars I’ve seen roll in and out of there, as well as for the quality work they did for me. So, I thought I would attend and show some of the cars that were around on that day. They were able to add a small amount of length to the Road Race autocross perches I had added to the car, which made the Progress sway bar fit just below the new larger exhaust pipe. It worked like a charm! The difference in driving that little Lancer with and without the sway bar was so significant that I could tell that the cornering was back from just pulling the car out of the parking space to leave. Nowadays, the Lancer has gone to a new home. I’m driving my wife’s Mk V Volkswagen Rabbit and I can’t afford to upgrade anything aside from little things like a drop in K&N filter and some Hawk brake pads to upgrade the fast wearing rears. Things could definitely be worse, because even with everything I did to the Lancer, the Rabbit is quicker and turns almost as well. It’s just not as raw as the Lancer was. But, despite the comfort that the newer Euro hatch provides, I of course still want to be around cars that are more powerful and raw. This is where S&R comes in. I’ve been in there a few times, for the sway bar, for an alignment when I drove over a tiny cobblestone curb in South Tampa that threw my rear alignment off on the way to work, little things. And every time I’m in there, there’s something new to look at. A 50’s Corvette dragster that can be heard from a mile away, a turbo 350Z convertible, a stock WRX just in for an oil change, and everything in between. So, I knew they wouldn’t disappoint. This was an unusual opportunity to walk around in the garage area and see what they had been working on. Due to obvious safety concerns, customers normally stay in the office. My attention was immediately drawn to this 1967 Shelby GT 500. It seems to have had an engine swap some time in the past, to a 351 Windsor, because as far as research is telling me, that wasn’t offered in the GT 500. It still sounded great, and depending on what it’s equipped with, it’s either making a little more or a little less power than it did originally, but likely in the same neighborhood. The really exciting part was that this snake is now in the process of getting a swap to a coyote V8 from the new Mustang GT. This should give a nice bump in horsepower and efficiency, as well as a significant drop in weight from the front end. Once complete, it will be a Cobra Coyote Mustang, not an animal that you want to tangle with. Edit: I’ve learned that this car is actually an Eleanor, a standard Mustang converted to Shelby GT 500 status. Still a very desirable car, but I thought this should be mentioned, because it explains the inclusion of the 351. There were a few other interesting rides sitting around. 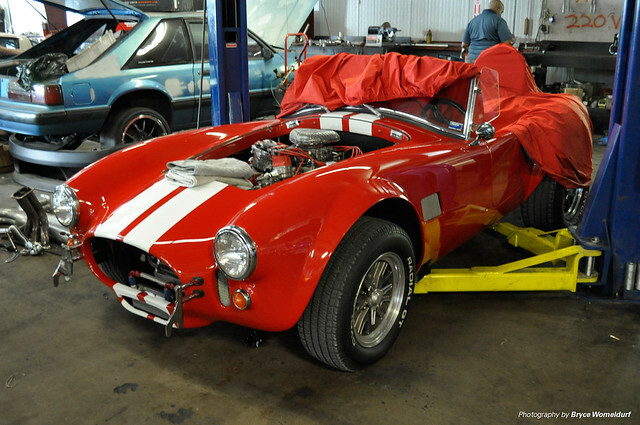 A Cobra 427 (most likely a kit, due to rarity). 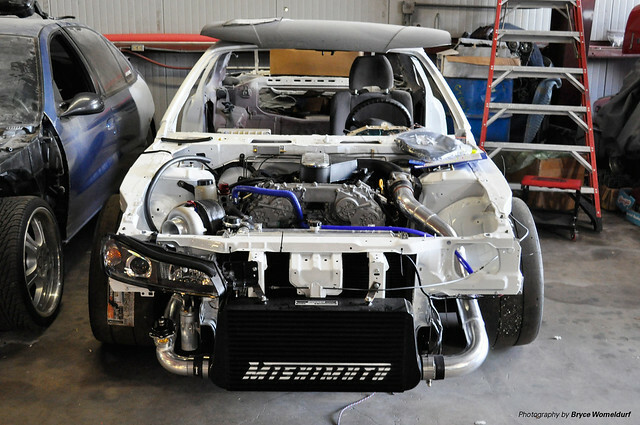 An S14.5 owned by BC Racing, which is undergoing an engine swap to the 350Z’s VQ35 V6 engine, along with a turbo. Supposedly, they just wanted 400 reliable horsepower, but it’s likely to produce more. A Corvette Z06 with a child’s seat. Raising them right! I think I’ve actually seen this Skyline-faced 240 on the street a few years back, when I worked in printing (pre-press). I was driving to work on I275 and saw what I thought was a GT-R, but when it took the Sligh Avenue exit behind me, I was able to see that it was an interesting front end swap instead. I don’t know who was driving it. The Evos were starting to show up (this was mostly an Evo-centered event), so I went outside to take a look and found what looked like an Evo IV. I’m not sure if someone made it out of a Mirage or if it’s the real thing, but it was definitely something new and different to look at. This Evo has apparently been eating a lot of it’s brethren from the land of the rising sun. A quick glance down into the bonnet reveals the red valve cover of the 4G63 engine. I didn’t notice this until later, but the side badge was much lower than you normally see on the factory car. 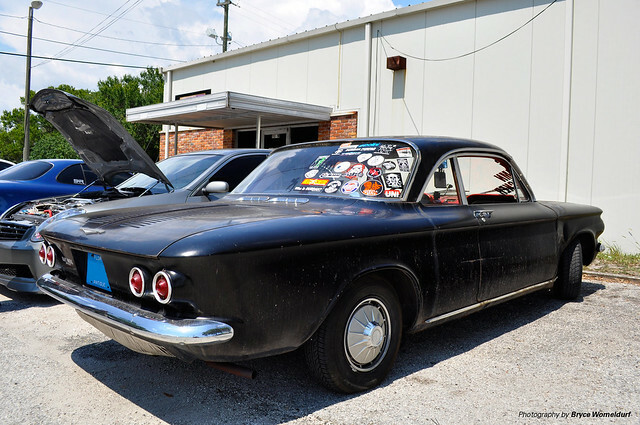 A few of these cars may look familiar to you, if you read this blog often. The VII for sure, and probably the IX, were both in an earlier post about Lucky Thunder’s last meet. I really like the color Blue By You. It’s always reminded me of the Laguna Seca blue that you see on E46 BMW M3’s. David Buschur’s BAD BISH Evo’s fatter Southern cousin? Ha! I kid. I say “fatter” only because it’s an MR, rather than an RS, like Buschur’s BAD BISH. It’s funny how strange an Evo can look at factory ride height after you’ve just looked at a bunch of lowered ones. Even still, I like the wheels. This STi got a boo boo. There was a nice variety of customer and shop cars in the lot as well. This is what I’d really like. An STI 5 door. I don’t know if I’ll be able to afford one once the Rabbit is paid off, but there’s always eBay Miatas. Towards the end, everyone was hanging out by the dyno to watch a Trailblazer SS and a couple of Evos get tuned. I got there right in time to see and hear this VIII make 559.1 “torques” as they say, and 417 horsepower. It was quite loud but fun to watch. Take a look below. Warning: the first one is kind of loud. If I remember right, the Trailblazer SS was making ~390hp at the wheels. Unfortunately, I couldn’t stick around to see what the Evo X made, because the heat started to get to me, so I went home. And the next day I woke up with a huge headache! My wife thinks it was heat exhaustion. Lesson learned. From now on I’ll carry lots of fluids, especially if I’m shooting two events outside. 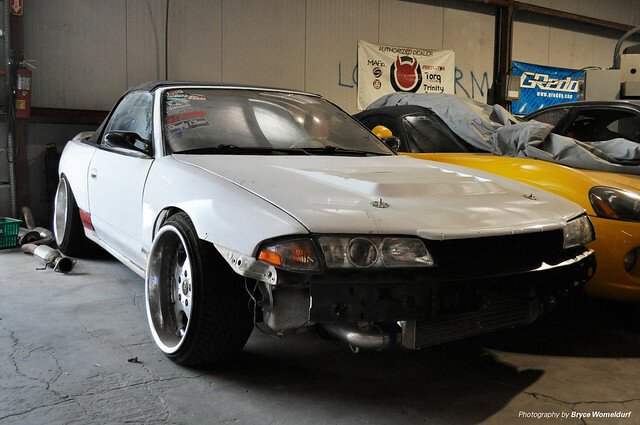 ← Enough Art… Now For Some Hooning!